FASHION DESIGN: The rectangular form eyeglasses is prescription(rx-able), you can replace them with your own prescription lenses at local optician store. 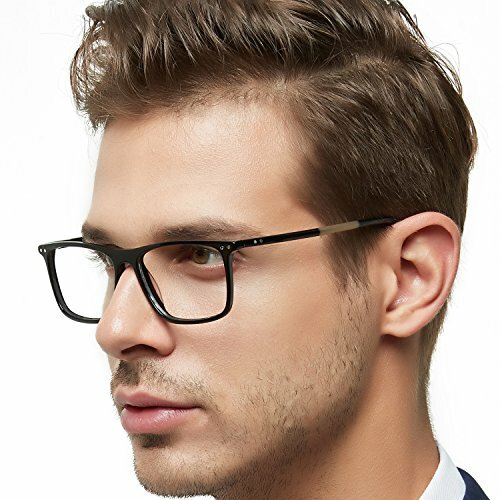 This eyeglasses is a good choice for fashion and stylish decoration, which can go with various of features and hair styles. HIGH QUALITY MATERIALS: The classic durable eyewear is made of acetate and comfortable nose pads design. This pair of vintage glasses with its one-piece nose pads design which will not oppress nose bridge. It will make you more stable and more comfortable to wear. 30 DAY MONEY BACK GUARANTEE: In case any broken problem happens, contact the seller without hesitation to solve the problem until satisfaction. You have no risk to try and we will provide you the best service!